This post is part of the Kelly's Closet Tips, Tricks and Hacks blog hop and giveaway! 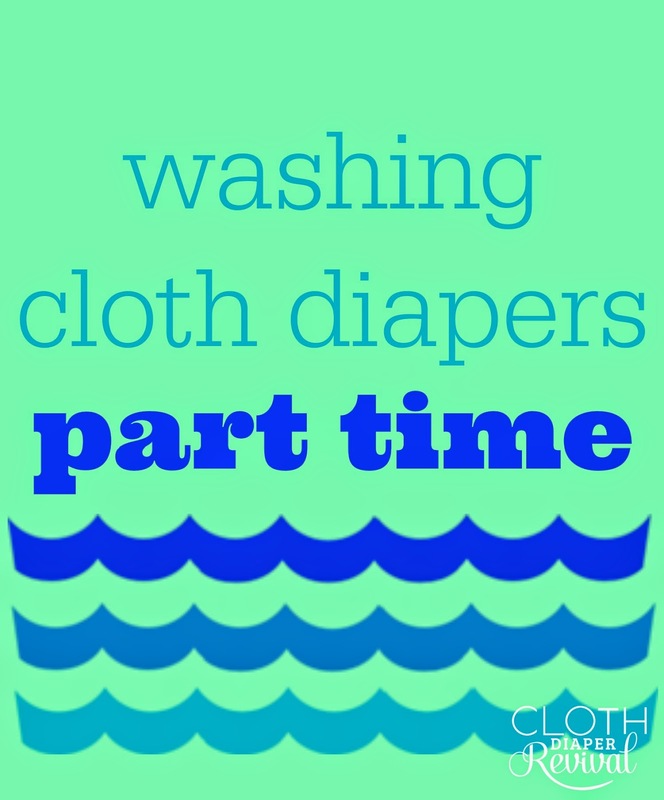 Read my tips below for washing diapers part-time and then enter the giveaway at the bottom of this post for a chance to win a $100 Kelly's Closet gift card! Be sure to hop to all of the other blogs and for more tips, tricks, and hacks! Sometimes it's not possible to cloth diaper full time or you may be potty training and still use diapers at nights and naps. Or have you ever found a dirty diaper after you've just finished washing your cloth diapers? You can still wash your diapers without a full load! Those no need to wait to have enough diapers to wash.
Keep a small hanging wet bag either near your changing table or in your bathroom, whichever is more convenient. When it's time to wash the diapers, every 2 -3 days, empty your diapers and the wet bag into the washing machine and follow the instructions below. Step 1: Do a rinse cycle with warm water on the smallest water setting. Step 2: Add your other laundry and your detergent. Don't forget to change your water setting to the correct load size if necessary. Wash as normal. You can wash with clothing, towels, or sheets. If washing with your clothes, you'll want to do your wash cycle on cold water so you don't shrink your clothing. If washing with sheets or towels, hot water is best. The rinse cycle helps to remove as much as waste as possible from your diapers so you aren't washing all of your laundry in pee and poop. I prefer to wash with sheets or towels so I can wash my diapers in hot water, but an occasional cold wash won't hurt. It is best not to try to wash just 3 or 4 diapers by themselves because the load size is too small and the diapers won't create enough friction to agitate together. This post is part of the Kelly's Closet Tips, Tricks an Cloth Diaper Hacks blog hop. The giveaway is sponsored by Kelly's Closet. Cloth Diaper Revival is not responsible for prize fulfillment. This post contains affiliate links. This is perfect for me since I'm a newbie and don't have a full stash yet! Great tips! I'm new to cloth diapering and want to make sure I'm taking good care of the diapers! Thanks for the tips! My LO is approaching potty training, and wondered how laundry would work. I would never have thought to wash with regular clothing, but that totally makes sense. Once you've rinsed out the ickies, it's totally fine! Although we use cloth full time and are nowhere near potty training, this info will definitely be helpful down the road! Never thought of the dipes not causing enough friction with only a few being washed! Thank you! Thanks for these great tips. I never thought about only washing a partial load - I haven't started my CD journey as baby isn't due until July 25th! Great tips! We have used cloth full time for a year and a half. Thanks for the tip! When it comes to potty train, we'll probably follow this advice! But for now, we have medium size loads!! I am about to start my first full load of dirties, really happy about this article and the rest of the blog hop articles. Great tips! Will definitely keep in mind for when we start potty training in a couple years. We're in the beginning stages of potty training, hopefully we can use these tips soon! That's a great idea! I always find a diaper that my husband changed right after I hang the diapers up to dry. I haven't thought about washing towels with them. I'll probably need to add something to the load since I have a HE washer. Thanks for the tip! Love knowing that I could wash cloth dipes with other items. Perfect! Getting laundry done in fewer loads, saving energy and time! Good tips! Full time right now, but still helpful. I seem to always forget a wet bag with just a couple of diapers! Good to know if I ever have a small load! Huh. I never thought to wash with regular clothing, only towels! Nice to know for the future! this is actually something I was wondering about just a few days ago. I'll be cloth diapering my first child due in october…every tip was helpful! super article, with a bonus contest! woo hoo! I've totally done this before. Definitely helpful in a pinch. I didn't know that it's more helpful to have other items in the wash to help agitate the diapers. I never thought to wash my diapers with sheets or towels! Thanks! Great tips! I just used my first cloth diaper (super undies night time) and used it for the first time and already had stink issues. Guess I should read someore laundry tips. Just started cloth diapering, but this is great to know for when we potty train! I never thought to wash them with clothes or towels after rinsing. That would cut down my loads of laundry per week. It was nice to now how to wash just a few diapers at a time and still have the wash be effective. I've never really thought of washing diapers with other laundry before. We are a family of 7 so there's always tons of laundry. Knocking out a load of laundry with the diapers sounds good to me! I've honestly never thought about washing them with towels. I'm cloth diapering two, and sometimes the loads get pretty big, but not big enough for 2. Splitting it and washing some with towels might be the answer! That's great advice! I always add my baby rags after my soak for a complete load. Thanks! I've never thought about washing diapers with other laundry. This is perfect for my potty trained 2 year old who wears nighttime diapers only. Thanks! great tips regarding water temperature! Needed this! Doing part time for now and hopefully full time later. Great top on the water temp too! Thanks! This is perfect for right before vacation, when I don't have a full load but yet can't wait till we get back! Good info to know - thanks for sharing! This was great as we are potty training and only going through 3 diapers a day! We're just getting ready to start cloth with our newborn due in a few weeks- this is great to know for the times that we'll have just a few to get done! This is helpful since I often have to wash to days in a row. Thanks for the info. I think this was helpful as it reminded me that I don't have to do every load in my routine, that I can deviate once in a while if the situation warrants it. I am anticipating using disposables at daycare and cloth at home, so any information on how to do this is awesome! Do you wash every 2 to 3 days even with a partial load because you should not leave them dirty longer than that? Yes, you don't really want to go longer than 2-3 days. I never thought about this! Thank you for the tips. Thanks for the great tips. Would be such a blessing to win this, we just found out we are adopting a newborn in sept and scrambling to get everything she will need!